We are a registered charity and a non profit organisation focusing on the rescue and re-homing of pets from Death Row in pounds. We have a NO-KILL policy. We offer a minimum 4 week trial with all pets and will take pets back if incompatible..
We have tax deductible status - donations of $2 or more are tax deductible. We are always in need of donations of food, litter, bedding, transport carriers and of course cash for our sometimes large vet bills. Some rescued pets are quite ill when rescued and need lots of specialist treatment & care before ready to be re-homed. We would love to save all the abandoned pets on Death Row but as this is impossible, we try to save as many as we have foster carers for. We have been successfully rescuing and re-homing companion animals, mostly cats and kittens since 2006. Our founding members are mostly from professional backgrounds including business management, information technology, education, nursing etc. We are all dedicated animal lovers, some with >15 years experience actively working with animal charities/rescue groups. At present we are all volunteers, however we hope that as Sydney Pet Rescue & Adoption develops, we will be in a position to gradually employ staff, thus to increase our capacity to help a greater number of animals. We do not have a central shelter but currently have foster carers in Engadine, Sylvania, Blakehurst, Gymea Bay, Como, Hurstville, Bexley, Rockdale, Banksia, Lugarno, Picnic Point, Beverly Park, Kogarah, Mortdale, Leumeah, Bradbury, Curran's Hill, Warrimoo & other areas. We now issue a regular newsletter. We anticipate establishing a member benefits program, which will make membership attractive, and promote quality companion animal services. Memberships will be invited in the near future. Come and join us!! You will find it immensely rewarding. Please download an adoption application form from our website www.sydneypetrescue.com.au and you will be contacted after it has been reviewed. Clementine (f) is a slender and elegant black and white cat, She has a lovely black coat (chocolate-brown in the sunlight), with a white blaze, bib, stomach and front paws, and enormous yellow-green eyes. Clementine is a gentle and friendly young cat with a quirky little personality, who likes company and a little space to explore. She was very thin when rescued but has put on a little weight and is in good health. 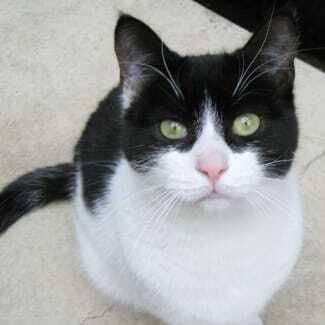 She has been a fastidious mother and plays lovely chasing and wrestling games with the kittens. Clementine is sociable with the other foster cats and very relaxed with human visitors, and is looking forward to her own special and loving home. 10/11/10 - clementine has been tested and is FIV negative. We offer a 4 week trial period with all pets and will take pets back if not compatible. Adoption fee of $200 for one cat, $150 for 2nd, includes vet check, 1st vaccination, micro-chipping, De-sexing and flea/worming treatment. Plus $40 if FIV testing has been done. Plus $53 if already lifetime registered. TC (Top Cat) steel grey tabby with a white bib, was rescued with his brother ChooChoo at 2wks old with their mum Izzy October 2013 - TC is a handsome black/charcoal male cat with a very gentle nature. He was formerly in foster care with his beloved brother Choo Choo. Choo Choo was injured earlier this year, necessitating a separation of the brothers. 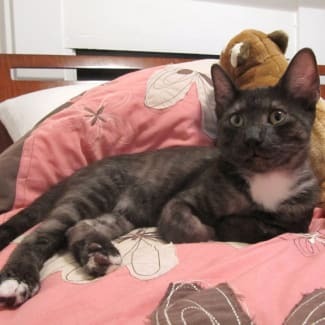 TC was at first reserved and missing his brother terribly, but then bonded in foster care with Missy, a beautiful brown female tabby kitten (see separate listing). Missy was as fearless as he was shy. She "brought him out of his shell" and \ they played, chased and wrestled together frequently; and, occasionally snuggled together in a bedtime embrace. Missy has moved on to another carer. 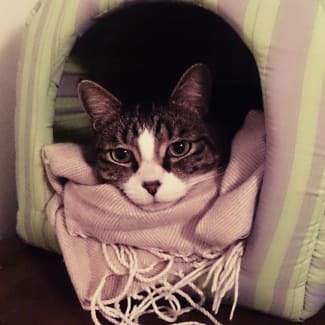 TC is looking for a new foster home or permanent home and would love to be adopted with another cat as a playmate or with his mum Izzy who is also looking for a home. He is well socialised and would make an ideal indoor companion. We offer a 4 week trial period with all pets and will take pets back if not compatible. Adoption fee of $200 for one cat, $150 for 2nd, includes vet check, 1st vaccination, micro-chipping, De-sexing and flea/worming treatment. Plus $40 if FIV testing has been done. Plus $53 if already lifetime registered. 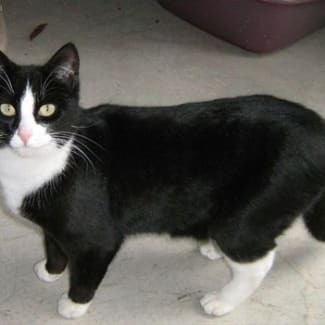 Dash (m) is a short-haired black and white cat. He was rescued with his mum Clementine from death row when he and his brother Indigo were only 1 day old. Clementine and Dash have similar personalities. They walk lightly on this planet. Both are rather shy with people (Dash more so than his mother) so if you are planning to adopt one or both of them, you will have to be very patient to gain their confidence. Being gentle is the key to gain their hearts. Once they warm to you, they are very engaging and gentle. If they are not both adopted by the same person, they will probably do best as the only pet in the household. We offer a 4 week trial period with all pets and will take pets back if not compatible. Adoption fee of $200 for one cat, $150 for 2nd, includes vet check, 1st vaccination, micro-chipping, De-sexing and flea/worming treatment. Plus $40 if FIV testing has been done. Plus $53 if already lifetime registered. 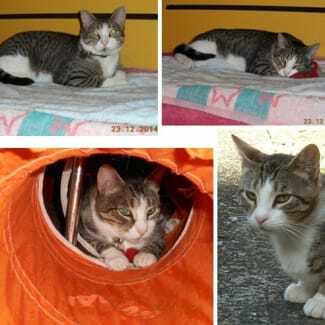 Jasper Jnr – Male – Spotted Tabby and white shorthair coat. Jasper is a big wuss and a bit shy at first, but once he gets to know you he is very smoochy. He has a lovely purr. August 2012- Update from Meryl - Jasper is very much a boisterous boy. He has an incredibly good nature, I have been looking after Jasper and his sister for two years now, and not once has either scratched me. They are still quite shy - especially around new people and loud noises, especially the vacuum cleaner. They have a lot of energy and both really enjoy playing - their favorite toy is a dangled shoe lace! They both love a cuddle, and to sit as close as possible to you on the sofa or bed and snuggle up to you. Jasper is a very talkative little boy, and greets you with a constant chatter. Jasper will make a lovely pet for someone who will love him and give him lots of love and attention. He will appreciate a large living area with plenty to keep him amused and with things to climb. He is suitable for a home without dogs or small children We offer a 4 week trial period with all pets and will take pets back if not compatible. Adoption fee of $200 for one cat, $150 for 2nd, includes vet check, 1st vaccination, micro-chipping, De-sexing and flea/worming treatment. Plus $40 if FIV testing has been done. Plus $53 if already lifetime registered. Hi, My name is Scotty and I was born in Jan 2010 I think. I am sharing Lucy's home with Pixie and 3 other cats. I am very friendly and like to give them head butts to say hello. I love being brushed and made a fuss of. I won't jump onto your lap but if you pick me up I will let you stroke me and will purr for you. I have a very quiet meow. I am toilet trained and always cover up everything in my litter box. I love my food and especially raw chicken necks..yumm. We offer a 4 week trial period with all pets and will take pets back if not compatible. Adoption fee of $200 for one cat, $150 for 2nd, includes vet check, 1st vaccination, micro-chipping, De-sexing and flea/worming treatment. Plus $40 if FIV testing has been done. Plus $53 if already lifetime registered.